Purchasing a rug is kind of a big deal. The type of rug you choose exerts great influence over the rest of the room and is therefore something you want to consider thoughtfully. While I've been scouring the internet over the past few weeks in search of the perfect area rug for our main room, I keep finding myself drawn to modern rugs with a Moroccan flair. 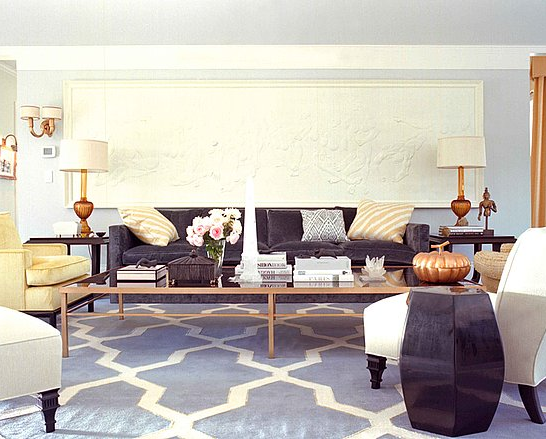 I love the graphic presence they have in a space and their surprising versatility. A friend of mine recently posted a picture of her Christmas tree on top of her gorgeous yellow moroccan rug from Pottery Barn. So yes, definitely RIP to those rugs. Thanks for your list! I've been eying the Fallon rug for a while, I just wish the pattern was more bold! This is a great list...I've been searching for some rugs. I need your new address for a Christmas card! I'll email you. Hope all is well. I recently bought the fallon rug...it's fantastic! And you can't beat the price. Buying a rug is a big deal! I desperately need one in my living room but am having a hard time committing. sigh. It would actually be cheaper to go to Morocco and buy your rug in person and have them ship it to you. That's what we did....we saved a fortune and got gorgeous results. It's funny what modern rugs can do for your home. I always say there's modern and ultra-modern rugs. The former is much simpler to work with than the latter. If you do them right, though, they can hugely impact your home. Love that Juliette rug from HomeDecorators.com, I shop there, Overstock.com, and RugsHD.com for most of my stuff!